I have been writing up short summaries of my quest runs for quite a while now. 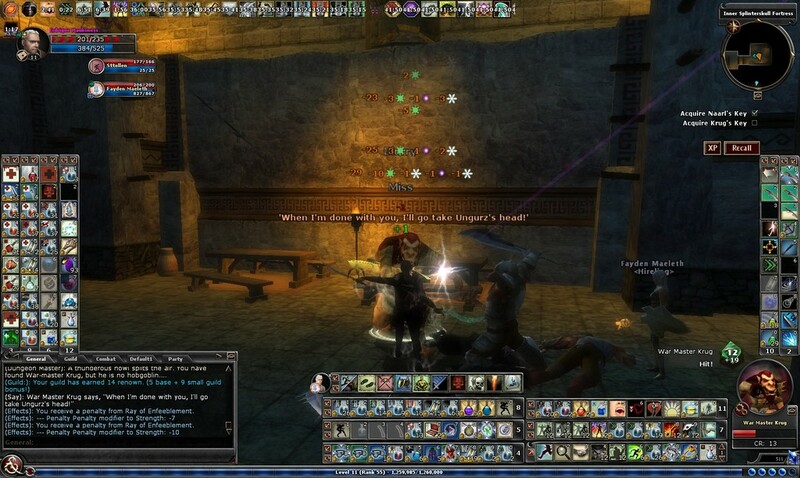 I mainly do this to highlight the various types of quest there are in DDO and for me to help track my own progress over time. I used to do compile two blogs a week to highlight these runs, one blog post would track my questing from Mondays to Thursdays and the second post would highlight my questing from Friday through Sunday. With the start of the new year I want to continue the general thoughts of summarizing my questing runs but I want to one post to cover the week. Of course, this blog will cover two weeks, since I didn’t get a chance to do one last week :(. To start the new year off, I took Erdrique (Level 10 Bard) and Sttollen (Level 11 Rogue) through Mirra’s Sleepless Nights, Purge the Herectics, Sorrowdusk Isle, The Iron Mines: Freeing Achka, and The Iron Mines: Justice for Grust. While making my way through Mirra’s Sleepless Nights I completed the optional for locating and destroying the source of the wailing. In Purge the Heretics, I completed the optional objectives to slaughter the halfling mercenaries and all of the commoners. When I went into Sorrowdusk Isle, to pick up and start the quests for Grey Moon, I collected 125 slayers for Erdrique and Sttollen, located all explorer points; collected the awards for slaying 10, 25, 50, and 100 slayers; and located and defeated Teargon, Furley, and Saate. Once inside the Iron Mines, I came across the rare encounter Powder in Freeing Achka and in Justice for Grust I defeated Corrosion, Chef Grank, and Champion Prienyl. However, while running through Justice for Grust, Erdrique got squashed by an ogre champion, which made the quest quite interesting. Erdrique making his way through Mirra’s Sleepless Nights. Erdrique fighting his way to Achka. Erdrique battling Corrosion in Justice for Grust. On January 2, I took Erdrique and Sttollen into the Searing Heights explorer area to kick things out for the day. While out there, I collected 226 slayers for Erdrique and Sttollen. 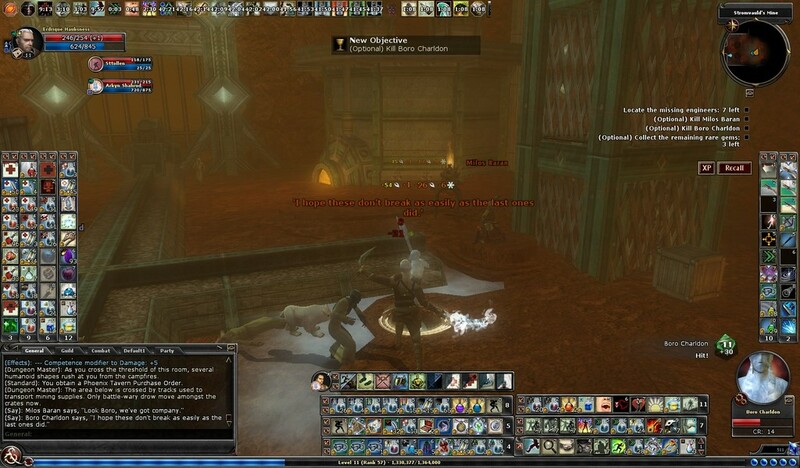 Erdrique also picked up a monster manual deed for orc hunter and received 2.260 experience. Both Erdrique and Sttollen collected the rewards for 10, 25, 50, 100, and 200 kills. The kills included the rare encounters for the first mate, Ghamzee, Calcine, Giallo, and Itharn Ushu. Erdrique also collected all of the explorer points. Later in the day, I took Erdrique and Sttollen back into Searing Heights and this time I collected all of the explorer points with Sttollen. I also collected 138 more slayers and collected the rare encounters for Shute Ruggzen, Hazai Haatha, and Cruor Russo. 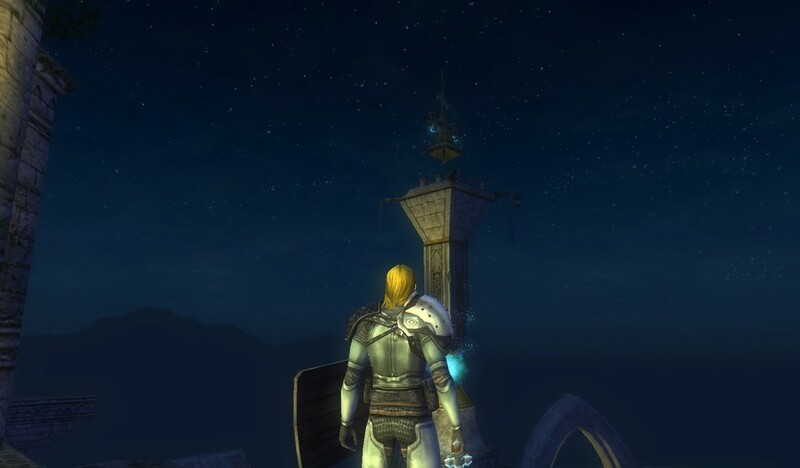 Erdrique taking on the sights of Searing Heights. I didn’t log back into DDO until Wednesday, January 4th. 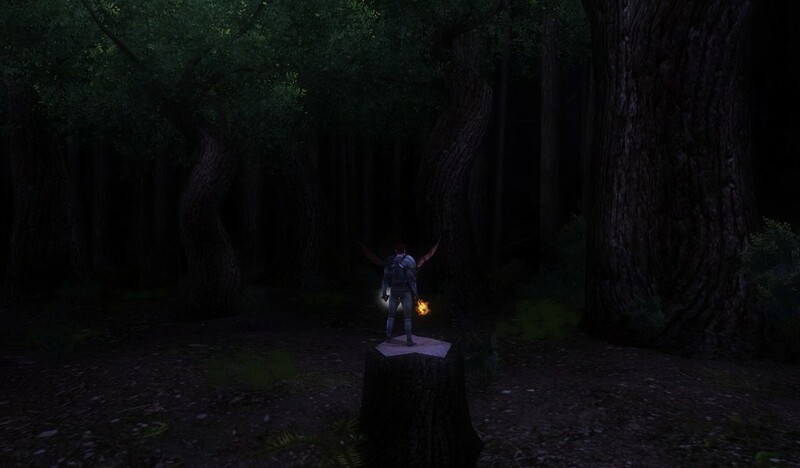 I took Garrrin (Level 23 Barbarian/Primal Avatar) out into the King’s Forrest. 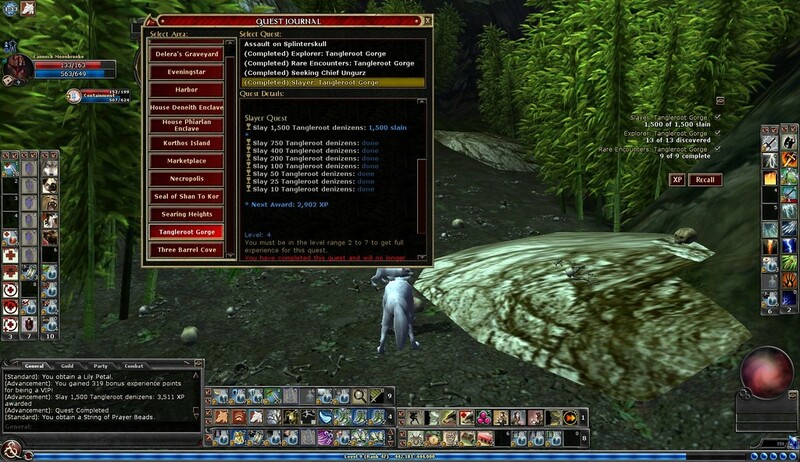 While out there, Garrrin collected 45 slayers including six dire bears and one astral panther. Shortly after that run, I then logged Hamllin (Level 20 Fighter/Shadow Dancer) and took him into the quest Memoirs of an Illusionary Larcenor on heroic elite. It was the first time I tried this particular quest and I wasn’t quite sure what to expect. I’m embarrassed to say that I wound up getting killed near to the end fight, primarily because I wasn’t paying attention to the fact my cleric hireling went down. But I did my revenge, eventually :). Hamllin exploring the intricacies of Memoirs. For Thursday, I started my questing by dual boxing with Cannock (Level 8 Druid) and Crawlller (Level 8 Ranger) into Tangleroot Gorge. Crawlller already has this area maxed out but Cannock collected another 50 slayers before I switched characters out. They also took out the wandering giant, Kroshk. Later that night, I logged on with Containment (Level 8 Cleric) and Cannock (once again) and took them through The Cloven Jaw Scourge: Caverns of Shaagh. Making my through that part of Shan-to-Kor, I completed the optional objectives for slaying the three ogres, slaying the three witch doctors, the three large elementals, and 75 hobgoblins. Dealing with the champions, Containment collected 15 mysterious remnants and Cannock collected 11. Cannock illustrating who the alpha wolf is in Tangleroot Gorge. Containment prepping for attacks from some hobgoblins in the Caverns of Shaagh. To kick off the weekend, I took Tuhnn (Level 16 Bladeforged) out into the Sands of Menechtarun for my regular slayer run. I forgot to record my slayer numbers but I did collect a monster manual deed for zombie exterminator and finished locating all of the explorer points. Tuhnn also looted a pair of the Gloves of the Falcon. After that run, I took Hamllin back into Memoirs of an Illusionary Larcener and this time I was able to complete it on heroic elite with little difficulty. That night, I logged on with Erdrique and Sttollen and I took them, first, through Gladewatch Outpost and then the Forgotten Caverns. While in Gladewatch Outpost, Erdrique picked 50 mysterious remnants and while in Forgotten Caverns they took out the optional for slaying Moldfang. After running through the Forgotten Caverns, I took Erdrique and Sttollen out into Tangleroot Gorge and completed Doom of the Witch Doctor: The Way to Zulkash and Doom of the Witch Doctor: Zulkash, Herald of Woe. To close out the night, I took Erdrique and Sttollen into Devil Assault and defeated all of the waves. In that run, Erdrique collected 17 mysterious remnants and Sttollen collected eight. Tuhnn hunting for some slayers in the desert. Hamllin exploring the dangers of Memoirs. Erdrique battling his way through the seige at Gladewatch Outpost. Battling the trolls of the Forgotten Caverns. Erdrique taking on the hobgoblins of Splinterskull. Erdrique setting the rune wheels to make his way to Zulkash. Preparing for the Devil Assault. Continuing with my weekend runs, on Saturday I logged back on with Erdrique and Sttollen and I took them through the quest Dead Predators, The Bounty Hunter, Caged Trolls, and the Bloody Crypt. While in the Bounty Hunter, Erdrique collected another monster manual deed for warforged hunter gaining him 471 experience. 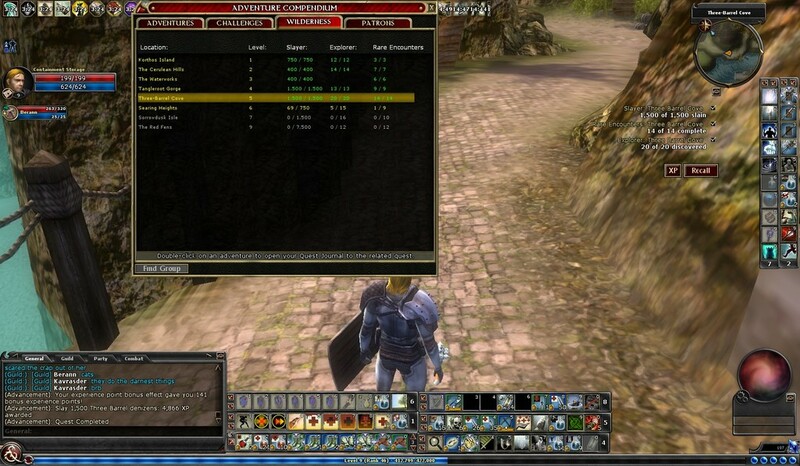 We also collected the optional objectives for freeing Annelisa and killing the troll chieftain and Ras Clowery. Erdrique picked up two more monster manual deeds in Caged Trolls, dwarf exterminator (1,130 experience) and dwarf hunter (2,260 experience). We also completed the optional objective of plundering the Emerald Claw’s treasure cache. The end the night, in the Bloody Crypt we collected the optional objective for slaying Gullet the Famished, defeating the Black Abbot’s legion, and slaying three priests of the Crimson Heart, Burning Heart, Immortal Heart, and Sanguine Heart. Time to plunder some loot in the Bounty Hunter. Erdrique battling his way through the Bloody Crypt with some help. The beginning of the second week, I started out by taking Stoorage (Level 15 Fighter) and Izmit (Level 15 Shadar-ki) into Caged Trolls and The Bounty Hunter for some simple favor runs. 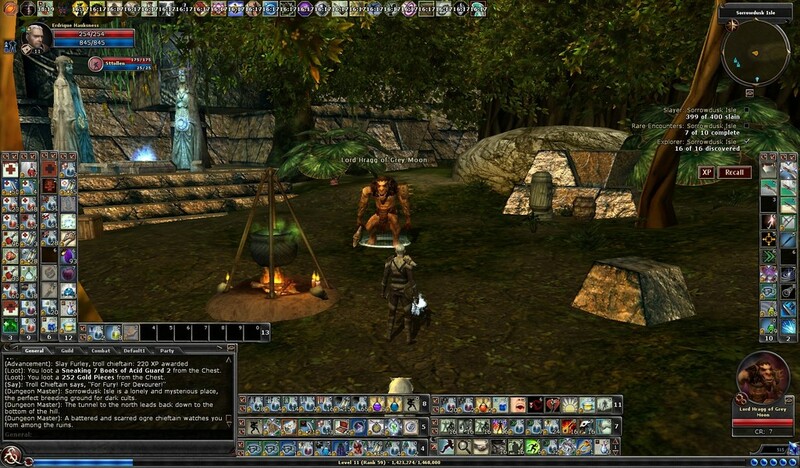 I completed the optional for plundering the Emerald Claw’s treasure cache in Cage Trolls and for the Bounty Hunter we completed the optional objectives for freeing Annelisa and slaying the troll chieftain and Ras Clowery. Stoorage making his way through the Caged Trolls. Stoorage exploring the Knaves Hollow. On Monday, January 9th I logged on with Stoorage once again and this time I dual boxed with my other fighter Charlock (Level 16). I took them into the Red Fens to work on another slayer run. While out there, Stoorage collected 118 more slayers (with the help of a slayer potion) while Charlock collected 95 more slayers. They also encountered Sharkbiter and Vyk Ka. Shortly after that run, I logged on with Erdrique and Sttollen and I took them through the quest, Bargain of Blood. I completed the optional objectives for finding the Deneith party, freeing the slaves, and destroying the assassination logbook. That night, I switched characters and logged on with Wapoyei (Level 24 Cleric/Divine Crusader) and I took him into the High Road while I was also playing with our digital PNP game. Wapoyei collected 81 more slayers and completed the random encounters for Wild Warriors, Trader Travels, and the Wood Woad. I collected one Commendation: Cleric of Amaunator. Stoorage battling the sahaugin of the Red Fens. Erdrique fighting off the Blood Tide pirates in Bargain of Blood. Wapoyei exploring the dangers of the High Road. 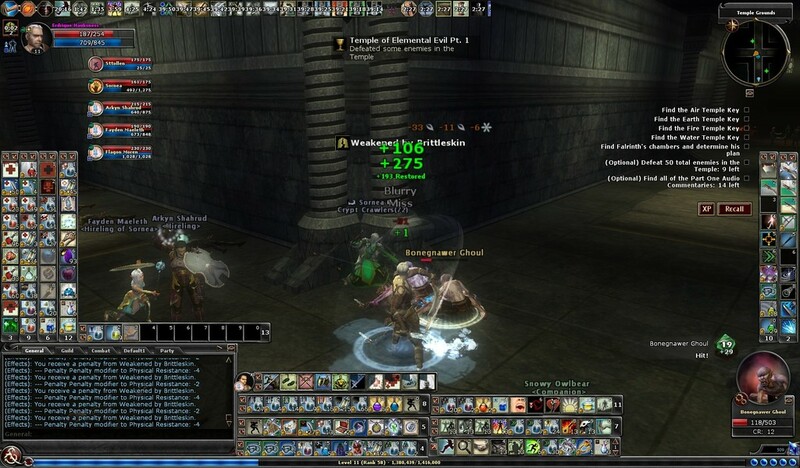 I logged on Hamllin to kick off things on Tuesday and I took him into the Ruins of Gianthold (Heroic) for some slayers. He came across two of the rare encounters, Lord Cirrus and Uthgur. As for the slayers, he collected 68 Storm Heart slayers and two Storm Fist slayers. After that run, I then took Hamllin into the next quest of the Slave Lords: Secret of the Slavers’ Stockade. I completed the two optional objectives to explore the abandoned tower and to speak to Lady Morwin Elissar. Later on Tuesday night, I took Berann and Containment, dual boxing, through the Tomb of the Burning Heart and The Mystery of Delera’s Tomb. The completed the optional objective of shattering the burning brigade in the Tomb of the Burning Heart. In Delera’s, Berann collected a monster manual deed for skeleton hunter earning 1,356 experience and the objectives for slaying Omaren Deathguard, Omaren Sentinel, Shade of Destruction, and 40 ghostly skeletons. Hamllin fighting off some ogres in Gianthold. Hamllin making his way through the Slavers’ Stockade. Berann making his way through the Tomb of the Burning Heart. 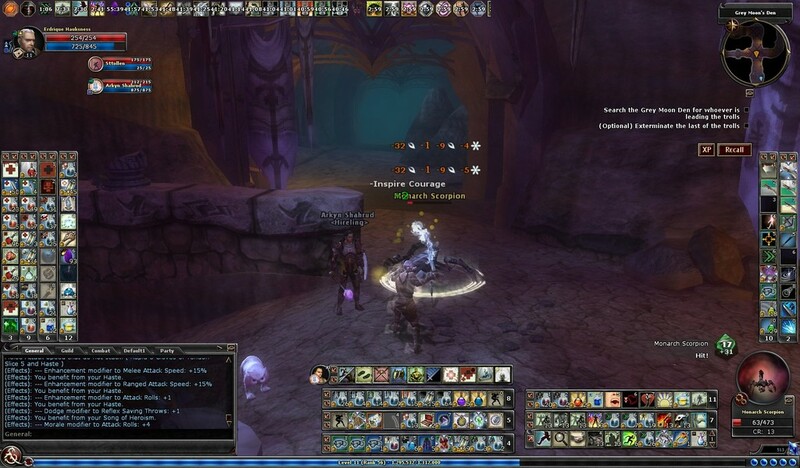 On Wednesday, January 11, I took Suppply (Level 11 Paladin) and Harrgon (Level 11 Favored Soul) into Sorrowdusk Isle. They both collected 103 slayers and took down the rare encounters Thanolin and Vermilo. Suppply also finished collecting all of the explorer areas. That was the only run I was able to knock out on that day. Suppply exploring the wilds of Sorrowdusk Isle. I took Wapoyei into The High Road, once again, to start things off on Thursday. Wapoyei collected 40 slayers and came across the random encounter for Spectral Sightings. After my slayer run, I took Hamllin into the quest Seigebreaker. Hamllin looted a Mark of the Tzaryan Rrac and Garments of Equilibrium. I completed the optional objectives for settng the tents on fire, poisoning the water supply, destroying the crates of provisions, and blowing up the explosive stockpiles. He also defeated Tinkerstab, Skinny, Major Pain, and Brinky. To end the night, I took Sludgge (Level 22 Rogue/Shadowdancer) into the Chains of Flame on epic normal. Sludgge collected a monster manual deed for mephit exterminator I and earned 423 experience. Making his way through the multiple levels of the Burning City, he collected five fragments of the Token of the Twelve and a complete Token of the Twelve. He also collected 11 commendations of valor as a quest reward. As for the optional objectives, he spoke to Valgrim Force-Bound, defeated Valgrim’s elemental guards, freed Valgrim Force-Bound, spoke to Erath the Blinded, transferred Erath’s curse, defeated the ogre mages, and freed Erath. Wapoyei doing some hunting in the High Road. Hamllin battling the forces of Droaam in Seigebreaker. Sludgge fighting his way through the gnolls of the Burning City. 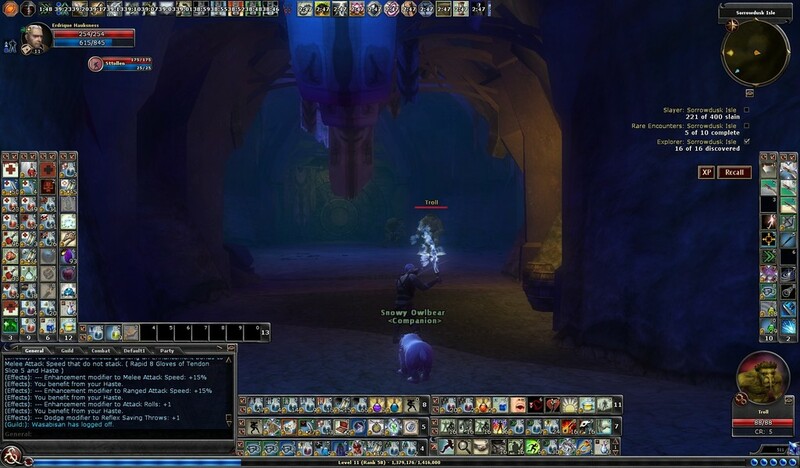 On Friday the 13th, I logged on with Sludgge and took him into the Ruins of Gianthold (Heroic) for some simple slayers. He came across Cirrus and collected 64 Storm Heart slayers and a single Storm Fist slayer. Later that night, after some maintenance, I took Erdrique and Sttollen into The Black Loch. Erdrique collected a monster manual deed for zombie exterminator and earned 1,356 experience and completed the optional ojbectives for killing the failed experiments and using the gold key. Unfortunately that was the only run I was able to complete that night. Sludgge making his way through the Ruins of Gianthold. Erdrique battling and spinning his way through the Black Loch. To close the two weeks out, I took Erdrique and Sttollen through Storm the Beaches and The Tide Tuns to complete the Sentinels of Stormreach Story arc. In Bargain of Blood, they completed the objectives for slaying pirates, more pirates, and even more pirates. In the Tide Turns they completed the optional objective for activating the barriers in the north and south barracks and trapping the pirates. Sttollen looted two Tarnished Heavy Deneith Chains while Erdrique looted the Torn Chitin Bracers and a Chimera’s Breath at the end of The Tide Turns. Time to prepare to lay seige to an island fortress. Erdrique battling his way through the Tide Tuns. So, a wide variety of runs over the first two weeks of the year that included epic and low level questing, numerous slayer runs, and range of character levels. I hope everybody else had a great start to the year as well!! Thanks for reading everybody and happy hunting! !